With delivery on the rise, operators of all food types are racing to embrace the new paradigm of convenience. Understandably so: Morgan Stanley and other industry analysts predict delivery sales will build at a compound annual growth rate of over 15 percent in the next five years, prompting a delivery ‘arms-with-bags’ race. Changes in consumer demand and the rise of last-mile delivery services will bring lifelong impact to the restaurant industry. As a result, decisions and deals are materializing fast, which means missteps can happen just as quickly – and they are. Just how much does setting the right foundation matter? To see a distant future resembling what Olo Founder & CEO Noah Glass calls the “sad path” of food on-demand, look no further than similar missteps in the travel industry. Hotel brands didn’t foresee the significance online travel agents would play quickly enough, and once they did grasp the big picture, it was too late to take control. For hoteliers, a fifteen-year battle wages on. Arne Sorenson, CEO of Marriott International, just proclaimed at the NYU International Hospitality Industry Investment Conference in June that his company is “in an absolute war for who owns the customer,” predicting more years of grappling with OTAs over customer engagement. So how can the restaurant industry embrace the exciting promise of delivery while maintaining the health of their businesses? As a foundation, they must avoid the four “worst practices” of delivery enablement to capitalize on delivery’s true potential. Picture it: you’re hungry for Bob’s Burgers and head over to BobsBurgers.com for delivery. Bob offers his own direct delivery, but clicking on the ‘Delivery’ link sends you off to a third-party site. To the majority of digital guests, this bump is negligible; however, to the restaurateur it means lost work to get you to the site and send you to another provider while paying a commission for the privilege. While marketplace partners undoubtedly provide solid streams of incremental orders for many brands, no brand that offers their own pickup/delivery experience should bounce visitors from their own .com or app to a third-party. This is also true for destinations like Yelp, Google My Business, and every other place on the web where menu and ordering links appear. Even worse, many restaurant locations are willingly posting on their front window/door delivery stickers advertising delivery services that charge the restaurant a 20-30 percent commission on every order, hog customer data, and list that very location next to its neighborhood competitors. It’s no surprise that secondary channels would drive a majority of orders without an aggressive digital marketing strategy to attract guests to “first-party” direct channels. Why is investing here important? Look again to the travel and lodging industry, where many hotel brands are actively working to win back guests to “book direct” through expensive loyalty programs that are the direct result of lost market share to sites like Expedia, Orbitz and Priceline. The antidote is a brand like Disney, which today retains 100 percent of its revenue through direct bookings and has been able to build pricing and inventory systems to fully control yield. As Olo CCO Marty Hahnfeld says, “not every hotel or restaurant brand could be Disney, but some certainly could if they had the vision to control their own future.” Those that do will be the ones to beat. Whether it’s Yum Brands and Grubhub or McDonalds and UberEats, we’re seeing many examples of close partner alignment with delivery. We’ve even heard executives go so far as printing marketplace partner’s name on marketing materials because of the delivery company’s “trusted household name” – only a few years old vs. the brand’s four decades of business. Aside from coverage concerns, there’s one simple reason to not sign an exclusive deal: each marketplace can bring a unique subset of customers to you. Incrementality between providers exists, as evidenced by Olo’s research across hundreds of thousands of delivery orders by email address. There is also the coming future of continued change and consolidation in the space that makes a 1×1 alignment more complicated. Change is inevitable, and marketers are reacting to new entrants in the space armed with big budgets aimed at converting guests searching for their own brand and food. It may sound fundamental, but the biggest mistake the restaurant marketer can make is to decide they can’t compete for their own brand searches. At Olo we know that it’s possible for brands of all sizes to compete and win – because we’ve seen it happen. In a study of over 300 restaurant brands, we identified that most brands are losing delivery searches for their own brand, but those that fight back with paid ads and brand-first marketplace deals can compete and win their fair share of the digital dining dollar. One thing is clear: delivery providers are establishing the terms of engagement for delivery and it’s up to the brands to step up and take control of the conversation. Look to leaders like Portillo’s for the best practices. If you already have delivery with multiple marketplaces, that means renegotiating for favorable terms for your brand. If you’re just getting started, we advise brands launch their own direct delivery channel (like many Olo brands have with Dispatch) and set strict parameters around any marketplace agreements you enter. Brands, technology providers, and guests will benefit as a result. 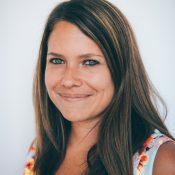 Jackie Berg is the Head of Marketing for Olo, the leading digital ordering and delivery engine for the restaurant industry. Since 2005, Olo has been the interface in between the on-demand world and over 200 restaurant brands. Since she joined Olo in 2014, the company has grown over 10x and today reaches 100 million consumers.